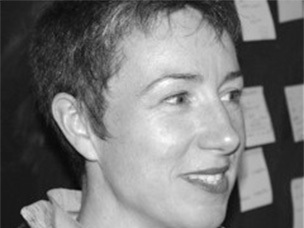 Hélène Day Fraser – Associate Dean, Master of Design Program, Jake Kerr Faculty of Graduate Studies, Emily Carr University. Helene is the Lead Investigator of the cloTHING(s) as Conversation research initiative and a founding member of Emily Carr’s Material Matters Research Centre. Hélène holds a Masters of Applied Arts in Design and a Bachelor of Applied Arts in Fashion. She is an Associate Professor at Emily Carr in the Faculties of Design and Dynamic Media and Graduate Studies. Hélène’s textile and garment-based work addresses concerns and developments in the areas of: sustainability, new digital technologies, craft and legacy practices of making and generative systems. Her research explores modes of social engagement, identity construction and clothing consumption habits. It is informed by a design education, and a past professional career in fashion, design, and manufacturing. Previously, Hélène was a cofounder of iF (Intelligent Forms Design Inc.), a member of the UBC Visual Voice project, a lead investigator of the DNA project and the U.K. based International Local Wisdom research network. In her former role as Emily Carr University’s Academic Co-ordinator for Sustainability, Hélène established Creatives with Intent (a group that promotes agency and communication pertaining to sustainability). Since 2010 she has spearheaded a partnership with Kenneth Gordon Maplewood School, using co-creative participatory research and textiles to engage and design for children with learning differences. Hélène is currently affiliated with the Emily Carr DESIS lab, Emily Carr HDL and also a Research Fellow of the Brooklyn Fashion + Design Accelerator.